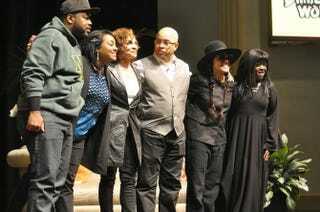 The cast of A Different World received the most appropriate greeting when it paid a visit to Norfolk State University this past Saturday. Jasmine Guy (Whitley), Kadeem Hardison (Dwayne), Darryl Bell (Ron), Cree Summer (Freddie) and Charnele Brown (Kim) spoke on a panel at NSU to benefit the Access College Foundation and NSU’s Honor College. As they walked onto the stage, the audience greeted them by singing the Different World theme song. In an interview with a local Virginia news outlet, Bell says he still gets misty-eyed when he speaks to people and they credit the show for their pursuit of higher education. With HBCUs like NSU suffering when it comes to funding and finances, it’s good to see the former cast making an effort to bring awareness to the issue.